The leader of Spain’s largest trade-union federation has called on Spanish youth to reject the precarious employment situation that they have been dealt after years of economic austerity and to organize themselves to demand more stable employment and better work conditions. Speaking at the presentation of a report on the conditions faced by younger workers in the Spanish labour market, Unai Sordo, general secretary of the Comisiones Obreras (CCOO, Workers’ Commissions) trade-union federation, said that workers under the age of 29 in Spain today are faced with a labour equivalent of military conscription. Forced to work long hours for low wages at seasonal and non-contractual jobs, Sordo said they face no real prospect of permanent employment for many years after they’ve entered the job market. 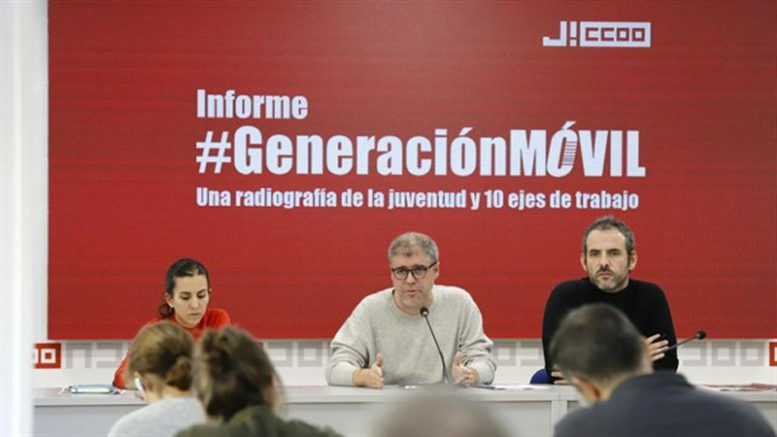 The CCOO’s latest report on youth employment, Generación Móvil” (Generation Mobile), so-titled because younger workers are forced to move around a lot from temporary job to job in today’s labour market, says that 66 percent of younger workers were employed under temporary contracts last year, with an additional 20 percent working just part time. That, according to the report, translates into a youth temporary employment rate that triples that of older Spanish workers, while the rate of part-time work for young people is double that of the Spanish workforce as a whole. The report lays the blame for the precarious reality of employment opportunities for young workers on the economic crisis that began in 2008 in Spain, noting that in 2007 young people entering Spain’s work force could expect to work at an average of 3.4 different jobs in a single year. Ten years later, in 2017 young workers were on average holding down 5.2 different temporary and part-time jobs in the course of a single year. Sordo said Spanish youth deserve better as they enter the labour market and called on young workers to get organized in much the same way their grandparents have organized to demand better retirement pensions, demonstrating to make their voices heard and demand that politicians pass legislation to make more opportunities available.